The Space Knight faces a new challenge in ROM #8 as his mission to rid the Earth of the Dire Wraiths following the arrival of two of his fellow warriors from the Solstar Order, Livia, and Orphion, who not only have links to ROM’s past, but have travelled to Earth to stop the Dire Wraiths at all costs – even if that price is the destruction of Earth! IDW Publishing’s new ROM series continues to go from strength to strength in ROM #8, with plot and script by Chris Ryall and Christos Gage, pencils and Inks by Paolo Villanell, and colors by Alessandra Alexakis. Following ROM’s initial skirmish with Orphion and Livia, Police Officer Camilla Byers was finally cured of the Wraith influence consuming her body (her infected arm was blown off during the battle), ROM’s attempts to reason with his Space Knight brethren only compounds their differences further during a run in with two rogue G.I. Joe operatives, and the Dire Wraiths begin to hatch even darker schemes to vanquish the Solstar Knights. ROM #8 sees ROM and Livia racing to intercept Orphion as he launched an attack on a drilling platform controlled by the Wraiths. Chris Ryall and Christos Gage continue to explore the bond between thee Space Knight characters as the issue. It seems ROM has deviated from their orders strict adherence to the Solstar Code, something which Orphion, his uncompromising superior officer has been sent to investigate, together with Livia, ROM’s childhood friend and former lover, but she Orhion’s Space Knight partner now and follows his orders to the letter. Their differences creates an exciting and tense dynamic between this trio of Solstar Knghts, especially when Orphion’s plan to flood the rigs drill with neutralizing energy to send a shockwave into the planets core and destroy the Earth becomes apparent, something which ROM is vehemently too opposed and selflessly prepared to put his life on the line to prevent! Ryall and Gage also build on the subplot involving the two aggrieved G.I Joe soldiers with an axe to grind about ROM’s actions during REVOLUTION, and Darby’s ongoing struggle to cope with her PTSD and her experiences with ROM all take a startling turn. Paolo Villanell’s artwork brings the stylish action-set pieces to life in this issue with a bold fervour that places us right in the thick of the action at all times. This issue unfolds in exhilarating blockbuster-like fashion, with ROM’s conflict with Livia and Orphan rapidly intercutting between numerous angles and viewpoints across the bold page layouts. Villanell ensures the Space Knights unique attributes and tactics are all impressively realized, and the raw strength and power displayed in their frenetically paced combat is an awesome sight to behold. The color by Alessandra Alexakis strikes a perfect contrasts between the gleaming metallic hues of the Space Knights and the fire fights of dazzling energy bolts that pepper the action, whilst the brief interludes featuring G.I. Joe operatives Beach Head and Grunt and war veteran Darby Mason respectively utilize warmer tones to provide a distinct contrast for these scenes away from the central conflict at the heart of the issue. 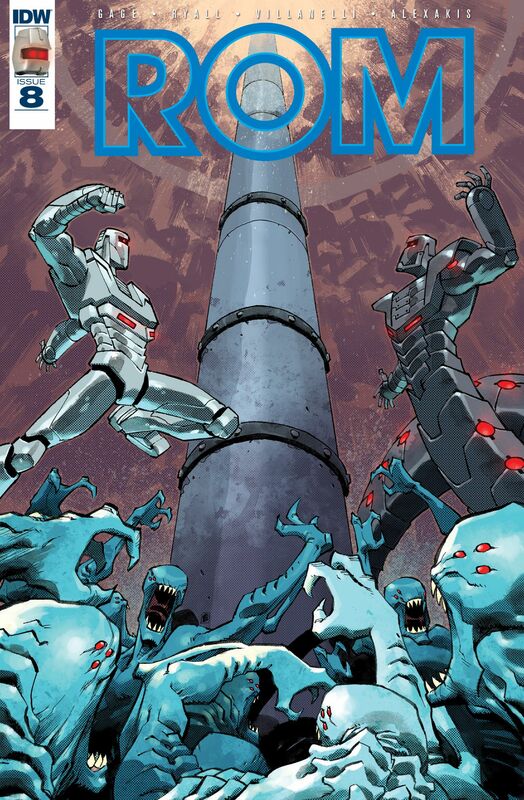 ROM #8: Reinforcements Part 4 is packed with wall to wall Space Knight action. Darby also makes a shock discovery, ROM’s no holds barred showdown with Orphian reaches a major turning point, and the Dire Wraiths gather their dark sorceries as they prepare to unleash a frightening new horror against the Space Knights! The characterization of ROM is pitch perfect throughout, from the subtle redesign of his classic armor, right through to the inflections of his dialogue, this series is lovingly structured to respect the character, and with the recent addition of two new Space Knights in the aftermath of the REVOLOUTION cross-over this title is really firing on all cylinders. Whether you’re a fan of the original Marvel comic book ROM series by Bill Mantlo and Sal Buscema, or a complete newbie, ROM #8 has something for everyone to enjoy as Chris Ryall, Christos Gage, Paolo Villanell, and Alessandra Alexakis continue make this reimagining of ROM one of the standout titles in the IDW Publishing and Hasbro Entertainments shared universe of characters. You always make it sound so good. I’ll get back into it one day, maybe when the trades start coming out. Another really cool ROM cover! This was a great read. Though I’m not as immersed into comics as I would like to be, so my knowledge isn’t very indept for knowing much about this, i have a great appreciation for it as I grew up watching th 90’s X- Men and Spider-Man.